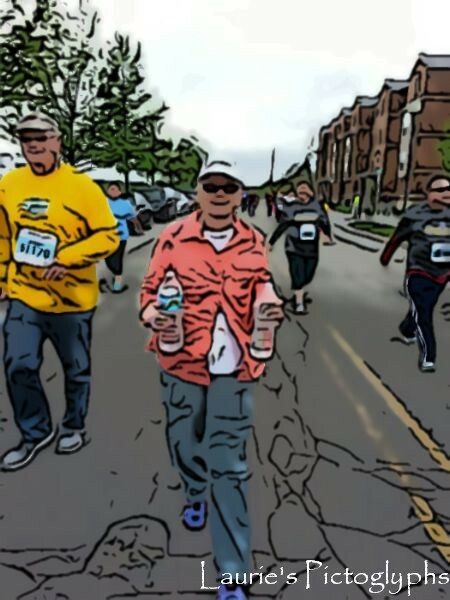 My family participated in the Indy Mini Marathon May 4th and had a great time. The day was overcast and perfect for the event. I did the 5 K, but my son Jason, and daughter-in-law Joni, my other daughter Angela, and my brother’s wife, Becky completed the Mini (13.1 miles)! Check out my previous post for an abstract of a parking garage! CONGRATULATIONS Laurie !!! That is awesome. I love your pictoglyph. My sweetheart gave me a bike yesterday, I haven’t been on one in many many moons but I am determined to ride again :). Sounds like fun! I love your edit. Congratulations on completing the 5K! I like what you did with the picture. Blessings! What a beautiful composition, happy career …! What a great accomplishment and such a fun and unique to showcase it. Good for you! How long is a mini marathon. I am sure it is still too long for me!